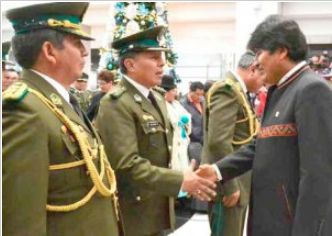 President Evo Morales in the act of possession of Rómulo Delgado as the new commanding general of the Police. Corruption scandals that surfaced in recent days denigrate the image of the Bolivian Police. In this regard the former policeman Jorge Santisteban identified the exercise of internal power and political patronage; order of destinations, valuation of promotions and internal judicial processes, as part of the chain. Meanwhile, the commander of the green olive Rómulo Delgado maintained that the particular cases do not involve the fundamental institution of the State. According to the criterion of the ex-colonel Jorge Santisteban, the functionality to the Government, to the partisan power, is another one of the factors that disintegrates to the police institution from its internal structure, which causes that the good officials with conviction of service move away and others end-up absorbed by the spheres of corruption. He also suggested the intervention and exhaustive review of the current order of destinations through a Government, Defense and Armed Forces Commission of the Legislative, in which opposition legislators must also participate. In the opinion of the ex-Defender of the People, Rolando Villena, facing the current situation the Bolivian Police should be under the Ministry of Justice. For the president of the House of Representatives, Víctor Borda, said: “Police that commit crimes should go to jail,” both for high-level officers down to low-level police. Bolivian Thoughts opinion: This is just the tip of the corruption-iceberg that evo created over the last 13 years of absolute control of ALL State powers. First he cut down two-year army promotion groups, that is, frightened the younger promotions and used the carrot/stick to dominate them. Second step was to subdue the police with similar actions … so that this populist demagogue could do as he pleased … this is why we need to prevent him from running for this years’ election. Not only he lost his chance in a Referendum but the blooming corruption across the public sector is sufficient to say ENOUGH!